We have a range of high quality Brix Meters & Refractometers at very competitive prices. 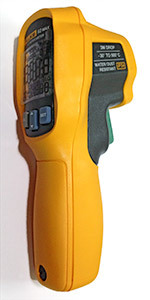 Hand-held & Digital all ranges. 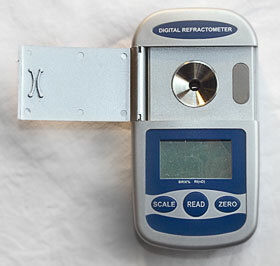 Salinity Refractometers are also available. 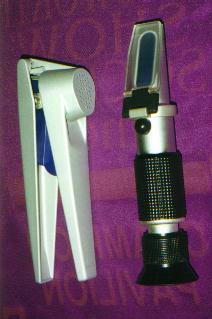 Photo at right shows a simulated view through the Refractometer Lens. The special Sap Press (at left left-hand in photo) is ideal for obtaining the sap for your meter and it is dishwasher safe. Mr Farmer, would you like to measure the quality of your crops, cereals, pastures, vegetables, fruits etc. while they are growing? For more information on the use of the Brix Refractometers contact The Meter Man, David von Pein. Contact The Meter Man. Measure plant stress by comparing the difference between ambient air and plant foliage temperature in the field. Infrared Plant Stress Monitors can also be used for food, cooking, cold rooms and many other surface temperatures measurement uses. 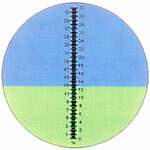 Quick and simple to use, there are several models available.